I applaud women who wear bold colorful accessories, these fashion divas enjoy life and don’t try to blend in. Style divas know that with original jewelry the business uniform becomes powerful, casual wear is urban chic and that tired little black dress is glamorous again. So set the tone for how you want to live your life with how you accessorize. Step 1: To get started wear your new bolder jewelry around the house and get comfortable with your revitalized fashion style. Step 2: Have a fun night out wearing your cool new drop dangle earrings and to-die-for bracelet. This is important, compliments from friends and admirers will re-enforce your confidence. Step 3: Finally accessorize with a glamorous take-charge necklace and get the job you know you deserve. Don’t let anyone get away with passing you over ever again. Princess Necklace above casts a spell with pretty pink buttons hanging from elegant strands of chain. Necklace uses interesting shapes and details in a one-of-a-kind jewelry design perfect for soirees and romantic evenings. 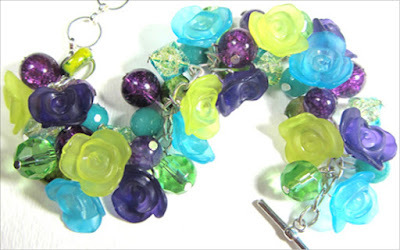 Vintage Style Flower Bracelet above has translucent flowers, dragon veins agate, aquamarine and crackle beads in purple and blue. Bring fabulous back with chunky chic jewelry and prepare for an influx of admirers. Candy Swirl Fashion Earrings shown just above have swirl donut beads and pretty accent beads combined with larger fashion buttons. Big yet lightweight drop dangles make it easy to add fashion flare to your look. A must have fashion accessory for fashion stars everywhere.